I have to share a few images from this fantastic edition of "The Three Bears". Published in 1942 by Random House; illustrated by Mary Cameron. It's just about perfect, don't you think? 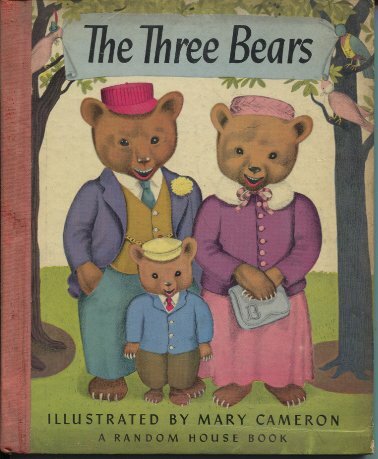 But I have to admit, I never pictured The Three Bears in a gabled colonial with a formal duck pond, beehives, and chicken house. I am trying to locate a book that my great-grandma had. I can't remember the title, but is was a story of some bears in a zoo that got covered in paint so they looked like polar bears or brown bears (went from one to the other... not sure which). Does that sound familiar to you?